Adventures in Val Chisone and Around: Mountainboy visits "Big City"
Yesterday I had an excuse to go into Turin. The "Big City". ("Oh you don't want to go there cos there's lots of people and traffic! Not the big bad city?" 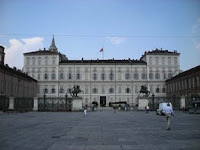 say the locals) Turin has a population of nearly 1,000,000. Well I had to go down to Turin mainy because our B&B has just been awarded the "marchio collettivo di Qualità dei B&B"
The what? I hear you ask. In English it means that we have passed a quality standard rating. 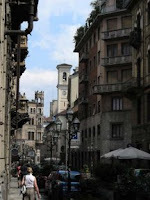 We now rate as one of the best B&Bs in the Provincia of Turin. In typical Italian beurocracy we can now apply to the provincia for permission to use the quality standard mark logo on our stationary, website etc. Unlike in the rest of the world where passing a standard automatically allows you to use the logos. I can only assume this is to keep some irritating little desk pilot in a job but it is typically Italian. After wasting an hour or so whilst the regional assessor for tourism could not even remember the name of the tourism office for the Olympic mountains (Montagnadoc for those and Sigra. 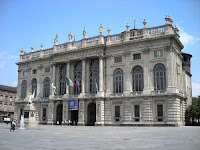 Manica's benefit), I was then able to escape and enjoy the delights of Turin. 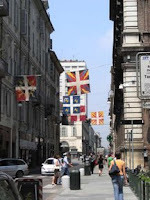 Turin is where they make cars, isn't it? Yes it is the Home of FIAT, Alfa Romeo, Lancia and others but it is also one of the most beautiful cities in Europe with a lot to offer. Some of the best cafes in Italy can be found here as well as some fantastic examples of Baroque archiatecture. Historically it was the first capital city of Italy, was the seat of the Italian film industry (I am sure you can name a few Italian film directors) , the main stage of the original "Italian Job"and home to the Winter Olympics 2006. Slowfood has it's flagship food shop "EATALY" where all gourmets can find some of the most tasteful food in the world as well as attend special chef lessons/dinners . Why not come and stay with us and let us organise an itinerary?